Over the last couple of years I have slowly become an Adult Fan of LEGO®, otherwise known as an AFOL! After building dozens of LEGO sets with my children when they were young, I rediscovered my fondness for carefully following directions in order to end up with the desired result. This is in marked contrast to my day job, where I am routinely called upon to create thousands of words of fresh content from scratch with no structure or guidance whatsoever. In 2015, I hope to design and build a Great Ball Contraption of my very own! In order to do this, I’ll need a healthy supply of various parts. It turns out that there’s a really interesting and well-organized international marketplace for new and used LEGO sets and parts and that’s why I am writing this post. 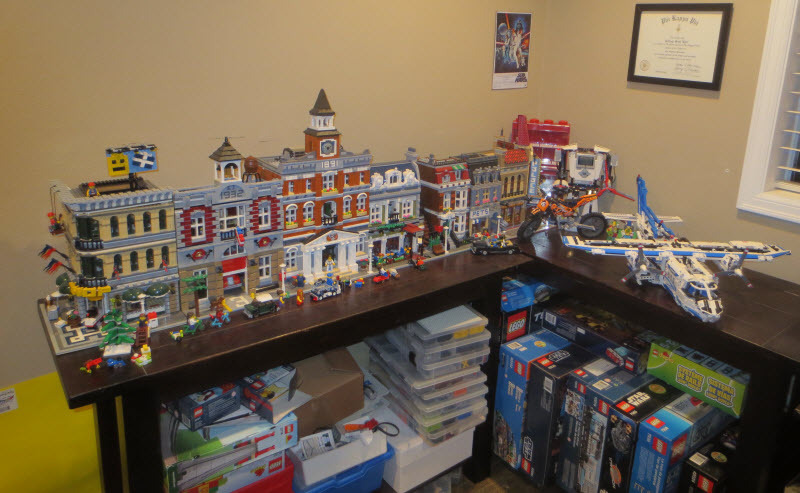 While I have no plans to be a LEGO seller, I thought I would take the time to organize and document what I found. According to the Brickset Parts Database over 27,197 LEGO parts have been in production at some point over the last 26 years. At any given time, a subset of these parts (in a subset of the 141 official colors) are actually in production. Each new part represents an investment of $50K to $80K in tooling and the company is careful to keep the number under control. According to the book Brick by Brick an earlier failure to pay attention to the proliferation of parts nearly destroyed the company just a decade or so ago. Today, according to a recent article in Issue 21 of HispaBrick, they design and produce 300 to 350 new parts per year and cease to produce about the same number. Most LEGO sets are available for a limited time. A particular part in a desired color might be found in a handful of sets. This scarcity is what creates value and makes the buying and selling of individual parts worthwhile for sellers. 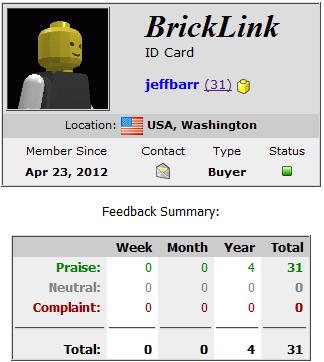 I should note that BrickLinks is just one place to buy and sell LEGO parts online. You can buy direct from LEGO Pick-A-Brick and you can also check out the new Brick Owl marketplace. Second, sellers can find many ways to differentiate themselves. They can decide to focus on shipments to or from a particular geographic area. They can accept various forms of payment, and they can specialize in different types of LEGO products (Duplo bricks, mini-figures, Technic parts, and so forth). 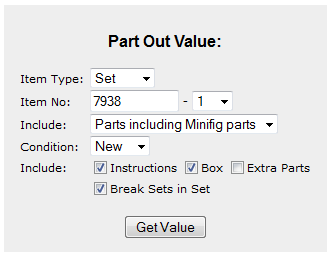 They can also set minimum lot and order sizes, and they can deal in sets, parts, or both. There’s a market for just about everything including the original boxes, sheets of stickers, and instructions. 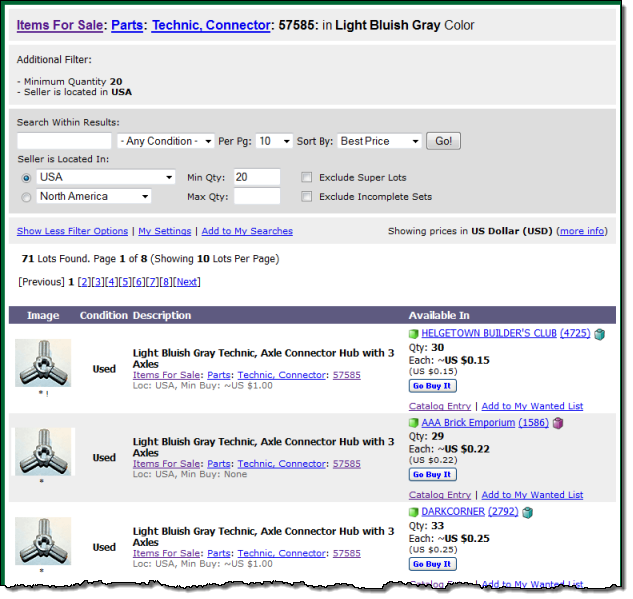 Sellers can offer new parts (taken directly from newly opened boxes), used parts (often acquired in bulk), or both. They can buy popular sets and hold them until production ceases, hoping that the value will rise over time (the Brick Picker Blog analyzes sets and themes and attempts to pick suitable long-term investments). Third, is that people are very clever and can turn almost any opportunity in to a full or part-time business of some sort. Some of the largest stores on BrickLink have millions of parts in their inventory; many others have 100,000 or more. Fourth, there are a multitude of variables to consider. Buying sets and parting them out is clearly labor-intensive. You’ll need to be well organized and have an eye for detail. Buying and holding sets can be lucrative but risky. You may need to hold on to sets well past their retirement dates in order to realize a good return. In order to do this you will need a large amount of secure, low-cost storage space (the “value density” of a box of bricks is fairly low, all things considered). International shipments can be profitable but complex and (again) labor-intensive due to the paperwork involved. Fifth, good accounting is key. With an inventory of tens or hundreds of thousands of low-cost parts, you need to know which parts and sets are the most profitable, which items are simply taking up space in your inventory, and so forth. You need to understand storage, shipping, packaging, and handling costs. You need to track costs and revenue, track and pay all appropriate taxes, and properly value and account for your time. With all of these thoughts in mind, I spent some time exploring this space from the seller’s point of view. Sellers must be able to find a unique selling proposition and then capitalize on it in order to create a successful business. As I mentioned above, they have many options. With a business model in mind, sellers need to acquire inventory. 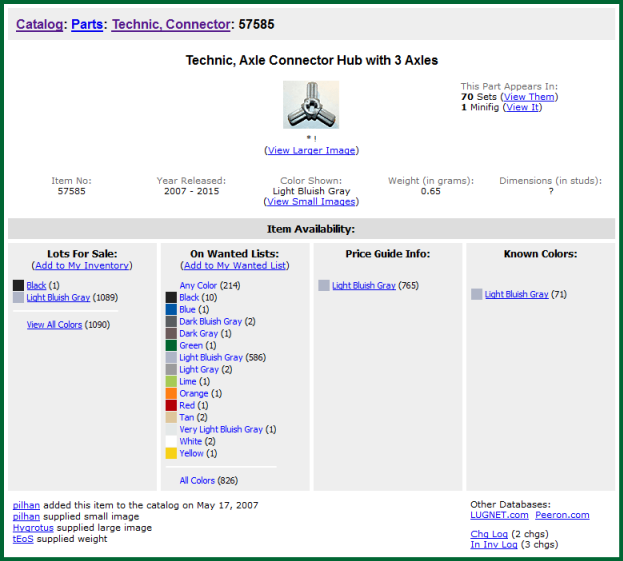 They can acquired used inventory in bulk from eBay, Craigslist, and local sources such as garage sales. New inventory comes from big-box stores, toy stores, and the link. 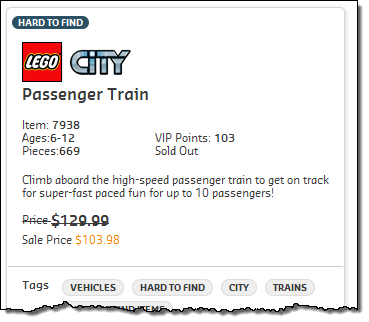 Astute sellers are quick to jump on sales and take advantage of LEGO VIP membership, coupons, special offers, discount codes, and credit card loyalty programs. A savvy seller would pick up some sets at this time in order to maximize their return. Obviously, there’s a very short time window between “End of Life” and “Sold Out” and you need to act fast. Buying sets at this time should increase returns due to the lower purchase price and the opportunity for a faster inventory turn. Selling parts and sets is a service business and good customer service is a must! A successful seller has to be able to pack and ship the goods on time and as promised, provide tracking numbers, and respond to complaints and other inquiries on a timely basis. Reputation is everything in this business. This post is getting kind of long and I have just scratched the surface of this fascinating topic. I’ll wrap up with some interesting resources so that you can continue to investigate. There are also lots of good YouTube videos. Chris Byrne (Bricks on the Dollar) is prolific, entertaining, and informative. He also writes the Bricks on the Dollar blog. Check out his Instagram Feed to get a sense for the scale of his operation. Yankee Brick Picker seems to run on a smaller scale, but also looks interesting. I hope you have enjoyed this quick look at a fascinating brick-based economy! If you have suggestions for updates, please contact me. Twelve years ago today I drove to Seattle and started working at Amazon.com. Today seems like a good time to tell the story of how and why I joined the company and to retrace my career path to date. 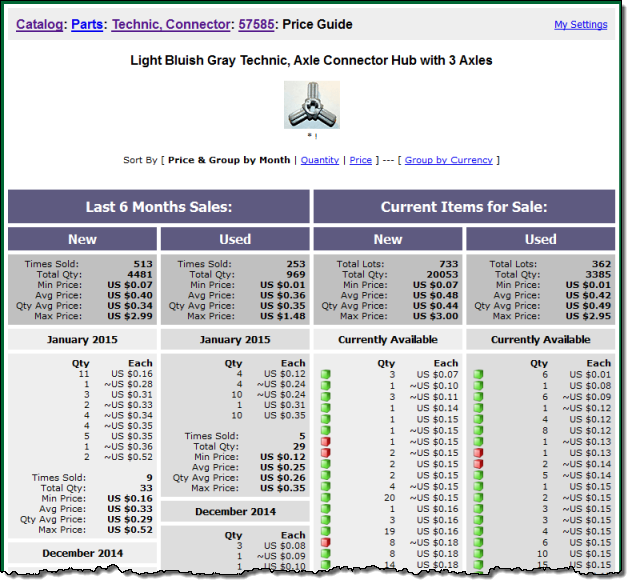 All that changed in the spring of 2002 when the very first Amazon.com Web Service (as it was called at the time) emerged in beta form. 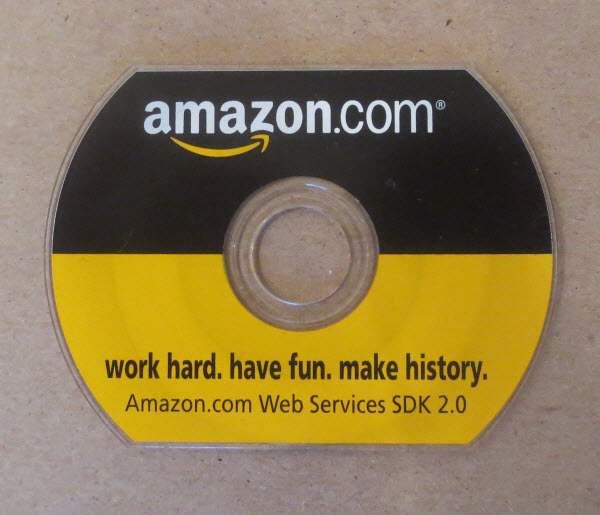 This simple service offered SOAP and XML interfaces to the Amazon product catalog and allowed developers to earn revenue through the Amazon Associates program. I became aware of this service, signed up for the beta, and downloaded the SDK. I wrote some simple PHP applications to try it out, and then built and briefly distributed a PHP library to simplify access to the data. I was impressed and intrigued and sent them some feedback and offered to meet with them to share my feedback in person. At this time I was also running Syndic8, a directory of RSS and Atom feeds. 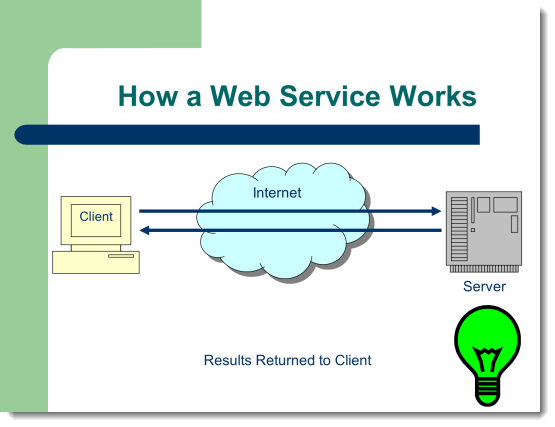 Syndic8 included a fairly comprehensive web services API built on top of the XML-RPC protocol. The product manager responded quickly and was happy to meet with me and to listen to my feedback. He also invited me to a modest developer conference that they were planning to conduct later that spring. The conference was held on the 6th floor of the Pac-Med building. Once a Marine hospital, this imposing edifice dates back to 1933 and sits on a prominent piece of land on Seattle’s Beacon Hill. It turned out that “modest” was an overstatement. There were either four or five guests, including Allan Engelhardt , who is still involved in what is now AWS. One of the other attendees was under the age of 18, and came to the conference from Germany. The attendees were outnumbered by the Amazon employees. We sat and listened as the speakers talked about their plans to build on their success and to expand their web service offering over time. One speaker (it may have been Colin Bryar but I am not sure) looked to the future and said that they would be looking around the company for other services to expose in the future. This was the proverbial light-bulb moment for me! It was obvious that they were thinking about developers, platforms, and APIs and I wanted to be a part of it. I turned to Sarah Spillman (who later married Colin Bryar) and said “You need to interview me for a position here.” She was happy to hear this and told me that recruiting was one of the goals of the conference. We’re putting out a welcome mat for developers — this is an important beginning and new direction for us. Developers can now incorporate Amazon.com content and features directly onto their own websites. We can’t wait to see how they’re going to surprise us. I left the conference and drove home, not realizing that I had just seen the future and that I would get to be a part of it! Later that week, the recruiting coordinator got in touch to initiate the hiring process. The first step was a phone screen. Given my development background, I was quizzed on C, C++, and even had to write some SQL over the phone. I must have done fine and they scheduled an in-person interview. I met with Colin, Sarah, Larry Hughes, Carl Christofferson, and Rob Frederick. Sarah actually asked me if I knew what Amazon.com did and if I had ever made a purchase! I expressed surprise that she would even need to ask, and she told me that many candidates knew nothing about the company and had yet to shop online. I was hired as a Senior Developer on the Amazon Associates team, reporting to Larry Hughes and reported for work on August 19, 2002. At that point the nascent web services effort was joined at the hip with the Associates program, sharing management and marketing leadership. My primary responsibility was a set of daily reports that tracked the growth of the Associates program. However, Larry also gave me the freedom to spend a little bit of my time (10% or so) helping out the web services team as I saw fit. The service was growing by leaps and bounds. I wrote some monitoring tools to make sure that it was healthy, built some sample code, and also helped out on the developer forums where possible. A few months in, I was asked to speak at a conference. This was presented to me as “None of us want to do it and you are the new guy, so we are dumping this on you.” Little did they know that I actually enjoyed speaking at conferences and that I was happy to accept their offer. I am fairly certain that this was a Seybold conference and that it was held in San Francisco, but I cannot find the presentation or any information about the conference. In early 2003, Sarah and Larry met with me. They said “We have been searching for a Web Services Evangelist for months, but it appears that you are already doing the job. Would you like a new role?” The job sounded intriguing but would require a lot of travel. I checked with my wife and my children to make sure that this would be acceptable, and it was. I accepted the position and the title change (to “Web Services Evangelist”) became effective on March 24, 2003! I brushed up my PowerPoint skills and decided that my goal was to simply spread the word about AWS to developers all over the world, raising awareness and encouraging them to build applications. Eleven years later, that’s still my job description. My early travels took me all over the US, to Japan, and to the UK (Hello, Slough!). Jeff Bezos and the “S Team” (the Senior VPs reporting to him) saw the potential for infrastructure services and put Andy Jassy in charge of the effort in 2003. Andy had built several other Amazon businesses from scratch and was ready to do it again. Andy shared early drafts of his “vision document” with me and I provided him with lots of feedback. The label AWS, once used to describe the service which provided access to the Amazon product catalog, became an umbrella term for a set of infrastructure services. We plan to provide you with useful information about AWS, products built with AWS, web services development tools, interviews with successful AWS developers,case studies, and information about the web services industry. I had no idea that this simple communication vehicle would become my primary work product a decade (and over 2000 posts) later. The decade has flown by and I don’t have the time or the space to cover it in depth. 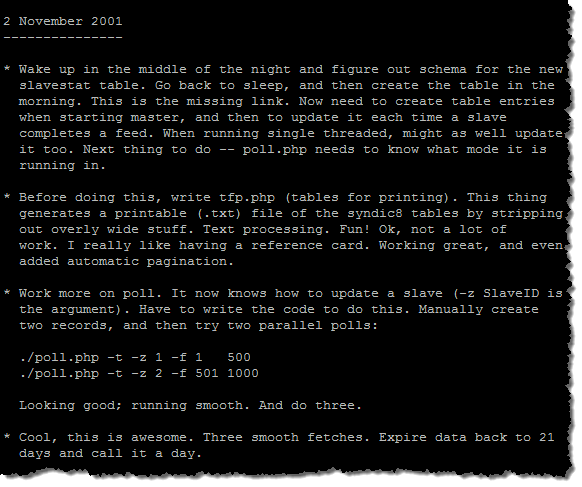 We launched the Simple Queue Service in late 2004, Amazon S3 in early 2006, and Amazon EC2 later that summer. I am proud of what I have accomplished, but I know that there’s a lot more to do. I have written over 2000 blog posts, one AWS book, and have earned six patents. I have traveled the world and have appeared in front of tens of thousands of people, and I drove across the United States for the AWS Road Trip and was the host of almost one hundred AWS Report videos. I have been promoted several times and am now Director of AWS Evangelism. I have had opportunities to manage people, but I am not very good at it and strongly prefer to be an individual contributor (IC). Fortunately, there’s a place for senior ICs at Amazon (me, James Hamilton, and Werner Vogels, to name some public examples) and there’s an IC ladder with another rung or two for me to climb in the future! Long-time readers of this blog know that I like to collect and share links that are of interest to me. With the blog’s rebirth, I am resuming this practice. On some days I’ll just throw out random links. On other days I am going to try for a theme. Today’s theme is LEGO. Over the years I have developed a set of productivity tips that seems to work well for me. I have shared them with my coworkers from time time with positive results, so I figured that they would make for a good post to get my blog back up and running. Once again, these work well for me. I am not religious about any of these; if you were to shadow me around for a week or two you would undoubtedly find me breaking each of them at one time or another. I have tried to illustrate each tip with an example or two of how I put it to use in practice. I try to treat all of my minutes as the same precious entities that they are. I don’t believe that I have “good” minutes when I am productive, and “bad” ones when I am not. In practice, this tip means that I try to take care of little things are they come in to view, rather than setting them aside where they might be forgotten. This tip is a direct consequence of the previous one. I still receive a fair number of paper bills in my mail box. I fetch the mail, recycle as much as I can right away, unsubscribe from stuff that I don’t want by using the Paper Karma app, put all magazines into my reading pile, and then immediately schedule all bills for online payment. This tip avoids late fees, piles of paper, and makes sure that I am on top of my financial situation. It is possible to classify a lot of tedious stuff that must be done every day or week as boring. I don’t. Instead, I find fulfilment in expeditiously managing all of the routine stuff so that I have more time to be creative. A lot of people seem to think that their life will change in some fundamental way if they suddenly or eventually become “successful,” whatever that is supposed to mean. They envision days filled with caviar, champagne, and private jets, not realizing that they still need to handle the everyday realities of life. I believe that this attitude leads to long-term dissatisfaction and to a life spent pursuing a fantasy lifestyle that does not actually exist. I try to simply enjoy being alive and doing what I enjoy. 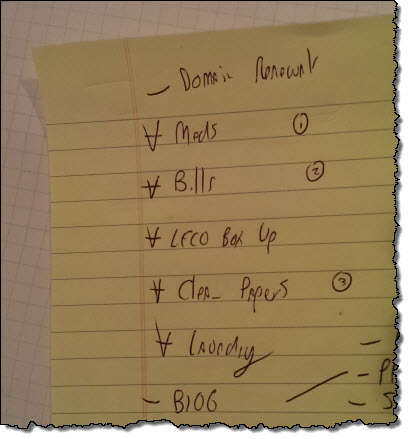 Over the years I have tried and ultimately discarded many different systems and tools for managing my TODO list. I used to track my tasks, calendar, and my days in a large Day-Timer. I used Emacs Org Mode for a while. Today, I keep a long-term TODO list as a draft-mode Outlook message. This list contains items that I want to do over the course of the upcoming hours, days, and weeks. Every morning, I examine the list, adding new items and reordering existing ones to reflect changing priorities. I also keep a handwritten list for smaller items. I do not obsess over my list, and I know that I will never get to the end of it. I will confess that I have managed to train myself to feel really good about checking off an item from the list. I’ll often put a couple of simple (yet entirely necessary) items on the list in order to have something worthwhile to do if I need a break from the bigger items. I also like to break large items into smaller, bite-sized items that I can push forward when I need some quick victories. Once again building on earlier items, I don’t check something off of the list until it is well and truly done. I don’t consider my paper bills to be actually paid until I have deposited them in the mail drop of our community mailbox and filed away the residual paper. When someone asks me to do something, I need to allocate time for it in order to make sure that it will actually get done. For work-related items, I estimate the amount of time required to do the work, and then I reserve that time on my Outlook calendar, marking it as Busy and Important. I also paste the original email and other necessary files into the appoinment to create a nice, self-contained “object” that I can just open up when the time comes to work on the item. I try to rid my desk of clutter and distractions. Besides my computer, my goal is to have my TODO list, one pen, one glass of water, and my phone close at hand. I’m not quite there yet, but that’s my goal. I strongly prefer the keyboard to the mouse, and sometimes tell myself that having to use the mouse is a “bug.” I will even navigate through menus using the appropriate keys on occasion. This tip, more than some of the others, is certainly a personal preference, but it definitely works for me. For long-running projects, it is a good idea to keep a log of what you did, and how you did it. This is great for development projects; you can track successes, failures, obscure commands that took you 30 minutes to discover, and much more. My one-time colleague Mark Dalrymple took my suggestion to heart many years ago; he documented his model in Logs is Logs. When I first started working with computers, my time at the keyboard was often limited to an hour or less per day. In order to satisfy my curiousity, I became an inveterate manual-reader. I would explore interesting commands and functions offline and then plan ahead so as to be able to make the most of my time at the keyboard. After I learned the language or system, I would always read the manual a second, third, or even fourth time. This allowed me to make sense of more complex features that I didn’t understand the first time or two. I have noticed that many people spend all day in their chosen text editor without bothering to learn how to take full advantage of it. Go back and read the manual again! I hate to spend time looking for my car keys. In general, I try to make certain kinds of things so routine that I don’t have to think twice about how do to them. When I arrive home my keys go into a designated container on my desk (I realize that the existence of this container conflicts with an earlier tip). When packing up after giving a conference talk, I unplug my laptop’s power supply, and put it into my messenger bag before doing anything else. Be curious, and read something intersting every day. Never wonder about things, dig it, search, and figure out what’s going on. Take some online courses, learn a new human or programming language, or go back to school. On a related note, be sure to keep all of your devices charged up. My colleague Scott Barneson refers to this as ABC – Always Be Charging. I have found that it is often possible to do something once and get credit for it twice! I’m not cheating, I am creating interesting synergies between my work, personal, and school lives. For example, I had always wanted to drive across the United States, stopping in interesting cities and giving AWS talks every night. As I was wrapping my time in the University of Washington’s MCDM program, I realized that trip could form the basis for an independent study project. The resulting web site and final report simultaneously satisified my work and school requirements. I also got a lot of first-hand experience with S3 Website Hosting and video processing. If you are taking on a new work project, see if you can use it as an opportunity to learn a new programming language or framework. My day job (writing the AWS Blog is surprisingly unstructured. Every day, I start out with a blank page and work to fill it with words and pictures that describe our offerings. I have found that I need to balance my unstructured job with other activities that are very structured. Lately, I have enjoyed building advanced LEGO Technic sets containing thousands of pieces. There’s something reassuring about being able to follow directions that result in a defined product at the end. This tip can take on a variety of forms. For me, it means that I fine-tune the settings on my tools and applications in order to make them work the way that I want. My .emacs file dates back to the late 1980’s; the shortcut keystrokes therein are now second nature to me. Similar recommendations apply to your physical working environment. Fine-tune your desk, car, office, and phone with affordances and tweaks to make them work the way that you want. I suspect that 3D printing will make customization of this time even more commonplace. The trick is to recognize friction points and to see what you can do to work past or around them. This may very well be my strangest tip; it is definitely the hardest one to describe. The idea here is to anticipate the next step of something that you do, and to do it as early as possible, preferably in conjunction with the prior step. The best example that comes to mind is sitting in my garage! I drive a manual transmission car. After I pull in to my garage and set the parking brake, I shift in to reverse before killing the engine. This leaves my car all set up and ready to go; I can start it up, let the oil circulate, and then let out the clutch to be on my way. I hope that you have enjoyed these tips, and that you are able to make use of them (suitably adopted). I had planned to resume my longstanding personal blogging regimen several months ago. The summer and the fall were very busy due to the AWS re:Invent conference and a large-scale kitchen renovation. both of these items are now in the past and I am once again ready to blog on a regular and frequent basis! This blog is now statically hosted on Amazon S3. The content is written in Markdown and turned into HTML by Octopress. The static blogging model obviates all of my scaling and security worries, and will let me focus on writing new and interesting content. I still have to sand off a few rough edges before the new hosting model is complete. I need to install a theme and I need to decide how I want to handle comments. With this new burst of excitement and energy, I will also be changing the focus (if there ever was one) of this blog to reflect my current interests. You’ll read a lot less about virtual worlds, news feeds, and syndication (I have nothing to do with any of these topics at present), and some more about cloud computing (above and beyond what I write in the AWS Blog, LEGO (especially Technic), and home-made pizza. After graduating from the University of Washington’s MCDM program last year, I decided to continue my education and applied to the Professional Master’s Program in Computer Science (PMP for short), also at the UW. I was accepted and am starting my first class today. After spending the past three years in the UW’s MCDM program (one class per quarter), I graduated last week. I now have a lot more free time and I plan to use some of it on this blog. As soon as the last of the dust settles I’ll resume blogging with a review of my time in the program. I also plan to port this blog to Octopress and to resume my regular link posts. Future topics include Raspberry Pi, Arduino, Lego, and 3D printing. 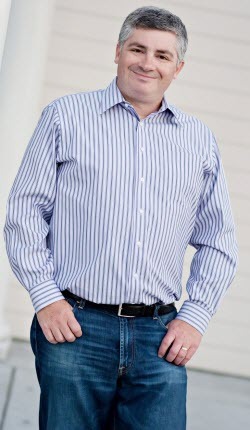 I live in Seattle, Washington and am Chief Evangelist for the Amazon Web Services. This is my personal blog.